When the last summer holidaymakers leave the beaches and winter sets in, the Cape Town surf season begins in earnest. The winter winds are offshore at Muizenberg beach, the city’s most popular surf spot. Beautifully shaped, clean, 2-4 foot waves appear with regularity. Deep ocean swell brings larger 4 – 6 foot or more roller coaster rides, and often enough there are magnificent surf days, clear, glassy days of magical surf experiences in-between. The wave here is renowned with beginner or accomplished surfers. On occasion there is a faster, onshore break, but its famous for long rides from a deep backline, especially when there is big swell. Beginner and expert longboarders paddle far out, while beginners ride, en masse, the foamey’s near the shore, and the easier mid break or reform. What makes Muizenberg such a popular local hangout and a great place for visitors as base camp is its location as a coastal village about a half an hour drive from the city centre and airport, and half way between Cape Point and Table Mountain, the city’s two most popular tourist destinations. Muizenberg beach early a.m., on a perfect, magical winter. Beautifully captured by surf enthusiast, Dave Jones, owner of Empire Cafe, a longtime local and Cape Town pre- or post surf institution. I filmed and edited this video in 2012, just before the local tourism started to boom, making Muizenberg the hottest place to be in Cape Town on weekends. Fortunately, the village feel remains intact. Its sea-view accommodation, restaurants, cafes, local entertainment and surf rentals, with equipment rental and lessons lets you eat, sleep and live surfing for a couple of days, and take in the surrounding scenic beauty. Here one does not have to go far for entertainment, to hunt down a wave, one can just be part of a tapestry of surfers of all descriptions, sizes, ages, gender and occupation, it all comes together pretty and seamelessly. Another bonus is that this area is by no means a tourists trap, especially in winter. I filmed a very small wave, late winters day at Muizenberg beach, also circa 2012. Chances are that you may be out there in pelting rain, usually lifting after a day or three, often to reveal the most lucid, clear surf experience. Especially on glassy, big swell days False Bay surely has one of the most scenic rides on the globe. Glorious at sunrise over the bay, epic at sunset. Another bonus is that the infamous Great White sharks are more frequently spotted in summer. 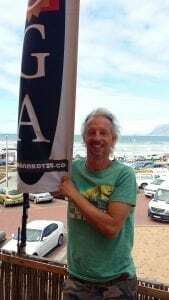 Cape surfing gets a fair amount of bad press regarding the sharks, not to mention the crime related bad press. Just know that the city’s shark spotter watch program and the small scale of the seaside village makes Muizenberg as safe a place to be as anywhere in the world, in the water or on land. Surf travellers looking for a well kept secret prepared to do cold water (but not freezing) surfing would do well to head out to these shores near the southern tip of Africa. There is a magic here, not the idyllic island style life of warmer climes to be sure, rather a soulful, elemental magic. Perhaps it is the experience of nature, the view of the mountain ranges in the distance surrounding the bay, and Surfers Corner right up against the mountain, open sea all the way to the arctic. Knowing you’re surfing on the edge of fabulous Cape Town city, widely regarded as a top vacation destination, helps with the vibe. A blend of Californication, culturally, and geographically, and Europe, a first world within third world Africa, a mix at once fascinating and uneasy. So you want to explore the city and culture when there are no waves. The circular coastal road right around the peninsula makes for a great day trip. If you’re taking a board with you, that may be a good choice, there are many excellent surf spots along the way. Ask a local when there, and you may find yourself invited to a party or two and you have the surf holiday of a lifetime. Story, videos and images by Johann Kotze, local soul surfer, yoga instructor and musician.